The Appalachian Mountain Club and the White Mountain National Forest hosted a Roundtable & Celebration of 100th Anniversary of White Mountain National Forest and 50th Anniversary of National Trail System on August 23, 2018. The meeting included a discussion on the outdoor recreation economy around the WMNF which was facilitated by June Hammond Rowan. Below is a news article about the event. BRETTON WOODS — The Appalachian Mountain Club (AMC) sponsored an educational and forward-looking event on Thursday, August 23, at the Highland Center to help the U.S. Forest Service (USFS) and North Country celebrate the 100th anniversary of the establishment of the White Mountain National Forest (WMNF), now nearing 800,000 acres. On May 16, 1918, President Woodrow Wilson signed Executive Order 1449, creating the WMNF in New Hampshire and Maine. Today the WMNF is a major part of the state’s economic engine, contributing to the nearly $9 billion statewide outdoor recreation industry that supports nearly 80,000 jobs. 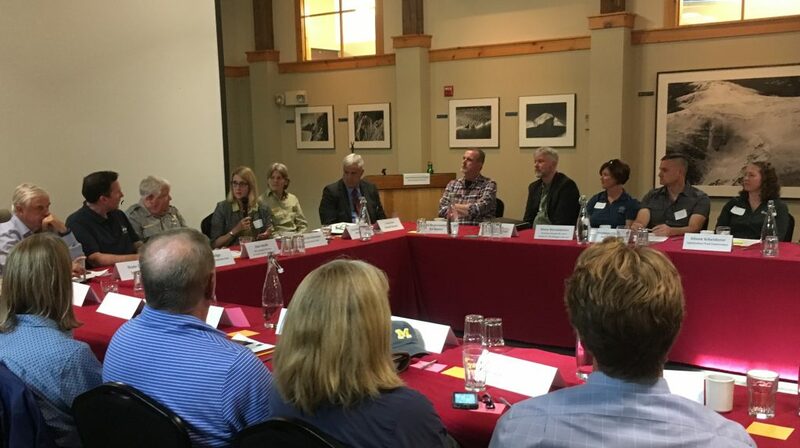 A roundtable discussion focused on the future of the state’s rural outdoor recreation economy and how to continue supporting the state’s traditional public-private partnerships. Welcoming remarks were made by both AMC president John Judge and WMNF Supervisor Clare Mendelsohn as well as facilitator June Hammond Rowan, a research associate professor at the Center for the Environment at Plymouth State University (PSU) and a former land use planner in both Berlin and Plymouth. Mendelsohn said that the partners who had worked together a century ago to transform the WMNF into what is today had started with a denuded landscape, ravaged by fires. She urged everyone to go to the exhibit at the Museum of the White Mountains at PSU to learn about the Forest’s remarkable history. Two national figures — Vicky Christiansen, Interim Chief of the USFS, and Dan Smith, Deputy Director of the National Park Service (NPS), Exercising the Authority of the Director — sat at the head of the three-sided table. At the end of the hour-plus-long discussion, they both said they were delighted to have a chance to hear the perspectives of those familiar with the challenges in northern New Hampshire. Smith noted that he is a Maine native, and Christiansen credited the Weeks Act of 1911, that was shepherded through Congress by Lancaster native John W. Weeks of the 12th District in Mass., because of the many visionary stewards who worked together to create National Forests in the eastern U.S.
USFS retired forester Dave Govatski of Jefferson presented a 10-minute history of “The People’s Forest,” as the WMNF is nicknamed. Of all the National Forests, the WMNF had the most public support from a diverse group of citizens, organizations and businesses, he said. It protects the headwaters of four key rivers: Androscoggin, Saco, Connecticut and Pemigiwasset. Answers were both general and far-ranging. Baby boomers are staying active as they move into retirement, some said. Rep. Ed Butler of Hart’s Location, who co-owns the historic Notchland Inn, pointed out that the lodging and hospitality industry in the Whites is continuing to grow. But, he and others said, there is the challenge of overuse, such as that at Diana’s Baths in Bartlett located off the West Side Road which an inadequate parking lot that has caused visitor conflicts. N.H. House Speaker Gene Chandler of Bartlett said that he is concerned that some places on the WMNF are “being loved to death,” leading to eroded trails. Some places are being overrun, such as the Falling Waters Trail and Franconia Ridge Trail, and participants urged that efforts be made to redistribute hikers and other visitors. Those looking toward the 10 years are aiming for diversity in every aspect, including tourists, the forest economy, people going to new destinations as they are developed or promoted, and vibrant downtowns, as well how people use the land, trails and infrastructure plus funding sources. Cathy Conway of Jefferson, who has overseen N.H. Grand for some years, said that the PSU-North Country Economic Index reports that tourism is the only sector to grow in the northern N.H. economy to grow. Director Phil Bryce of the N.H. Department of Parks and Recreation explained that New Hampshire has always had a “customer focus,” an essential component of tourism. Judge said it is important to get young people out-of-doors. He would like to see more high school graduates work toward associate’s degrees, training for such skilled jobs as outdoor recreation, trail making and maintenance, and guiding and teaching. AMC would like to see people of color and other diversities enjoying and working in parks and national forests, making it so that who we see in these venues represents everybody in America. NH Senate Majority Leader Jeb Bradley of Wolfeboro, a 65-year-old hiking enthusiast, said that he places a high value on safety and access to all the WMNF. He said he believes that bridges in federal wilderness areas, such as the Thoreau Falls Bridge over the Pemigiwassset River, should not be removed because of hiker safety concerns. He praised the sale of volunteer NH Hike Safe Cards, sold by NH Fish and Game, and supports higher-intensity trail maintenance. A number of speakers talked about new or increased recreational activities on the WMNF or other state- or town-owned lands in which they are involved: Dave Harkless of Littleton Bike and Fitness; Rick Estes of Ossipee-based Owl’s Roost Outfitters; Alexa Bernotavicz of the Bretton Woods Ski Area at the Omni Mt. Washington; Stephen Clorite of the nonprofit Coos-based 1,000-mile Ride the Wilds (OHRV) route; Nate Harvey of the Great Glen Outdoor Center in Pinkham Notch; Carol Carlson-Cunningham of Carlson’s Lodge in Twin Mountain; and Rusty Talbot of the North Country Climbing Center in Lisbon. Several spoke of the today’s greater appeal of outdoor activities that are enjoyed by both visitors and residents, blurring the line that has kept “locals” separate from those “from away” that keeps dollars circulating in rural communities. Also at the table were: District I executive councilor Joe Kenney of Wakefield; Maura Adams of the Concord-based nonprofit Northern Forest Center; Matt Smith of the nonprofit White Mountain Trail Collective; Commissioner Taylor Caswell of the state Department of Business & Economic Affairs; Sandy Olney of the nonprofit Franconia-based Adaptive Sports Partners of the North Country and Alison Scheiderer of the nonprofit Harpers Ferry, WV-based Appalachian Trail Conservancy. Tyler Ray of the nonprofit North Conway-based Granite Backcountry (ski) Alliance also said that those living in the area must seek to find a balance between the demands of the recreation industry and maintaining the area’s natural beauty and unique attributes. 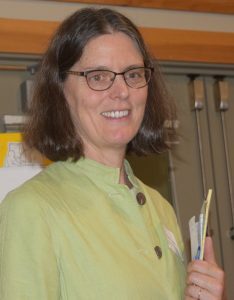 Forest Society president-forester Jane Difley pointed out in a strong statement that the nonprofit organization has considerable experience in tourism. It not only manages The Rocks Estate Christmas Tree Farm in Bethlehem, but is also a member of the White Mountain Attractions Association that now leases and operates the Lost River Gorge & Boulder Caves that the Society owns in Woodstock. Difley reminded that forests are not just “a pretty backdrop” for hikers and other recreationalists but also — with good stewardship — produce timber that supports a robust sawmill business sector and helps protect the state’s water quality.